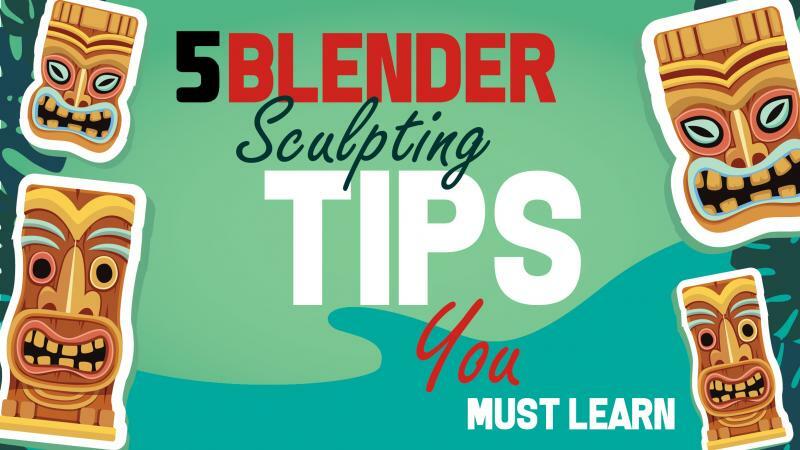 Are you are looking for Blender sculpting tips to help you get started? If so, you've come the right place! The tips given below will be useful to a beginner when handling large volumes of work. They will also go a long way in helping you to improve the overall models. We will discuss different blender sculpting tools and blender sculpting brushes that are available. To get started we will first discuss what Blender sculpting is. Blender software is a 3D computer graphics toolset used for digital sculpting and 3D modeling. So let us dive right in! Here are the tips you need to keep in mind when using Blender Sculpting Tools. When building a 3D model, it is ideal to start with a basic shape; this shape could be any 3D shape like a cylinder or a cube. You start building from this basic shape and then move up the ladder. The same thing also applies when you are going in for learning blender sculpting tips. It is crucial that you get started with major and vital details in your model. 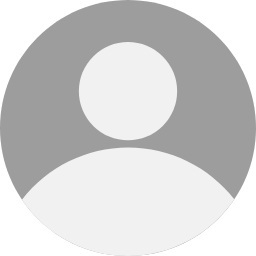 These could include features such as forms, the proportions which you are aiming at and of course having a prominent silhouette in mind, is critical. These choices will help you move forward seamlessly. It will also allow you to get the minute details, as far as the model is concerned, right. Get started with a rough base mesh. It will make things easier when it comes to more significant changes. You will not run the risk of crashing or damaging the model. When you are in the initial stages of learning digital sculpting tips, you must understand a few basic tips and techniques. They may seem too basic and insignificant but, they are without any doubt extremely valuable and needed. For example, always work with a large brush size that also has a relatively low intensity when using these tools. Further, it is always advisable to implement prominent muscle forms and proportions. Remember to always use, as few numbers of brush strokes, as you possibly can. The end result will look more cohesive that way. There are quite a few reference images you must use for getting a better grasp about the anatomy of your chosen object. This trick will be quite useful when you wish to have the right information about the areas where the muscle group of the legs and arms are to place and how well they can fit within the overall sculpt of your work. Such references will also help you to get a better idea of the texture as well. If you are creating or sculpting dragons or any other mythological objects, you may not be able to get your hands on the actual images of such entities. But, this tip also could be useful when it comes to scientific and intelligent blender sculpting scenarios and situations. When you are sculpting, especially as a beginner, it is quite easy for you to get carried away and move all around the model. Trying to handle too many aspects of the image could spoil the final product. Which is why it is important for you to understand the advantages of focusing on a single area so that your creation has the same high quality throughout. If you look at the works on any good digital art gallery, you will find that the most simple look images have complex details that are difficult to sort out in a hurry. The sculptors and artists, behind these creations, will have focused on a single area to work out the finest details. There are many who might sculpt one bit of the leg, one bit of the hand and move around over to other places. This style is, not necessarily the wrong way to go forward but when it comes to defining the finer points, it is always better to understand the importance of being focused. Once you choose an area to work on, finish as many details as you can before moving to the next point. Understanding more about the masking command is extremely crucial for the best results in sculpting. The command will help you a lot when there is a requirement to isolate certain important areas in your model. It will also help you concentrate and focus on only the one section of your image. So that you will not worry excessively about sculpting in other areas, which you do not intend to focus too much attention on. So, when you wish to sell sculpture online to the best of customers, this is a very important point, which you always must bear in mind. Masks also allow you to focus more on various parts of the model. They can also help you create new items and pieces such as gloves, armory and jewels and so on. Therefore, the above tips are some of the time tested and proven tips as far as sculpting using Blender software is concerned. Now let us take a look at some of the basic tools available in Blender and how you use them to create sculptures. Pushes mesh outward or inward into a spherical shape as required. Produces sharp indents or ridges by pushing or pulling the mesh, while tweaking the vertices together. The Flatten brush defines an “area plane” positioned by default at the average height above/below the vertices inside the brush section. The vertices are next pulled in the direction of this plane. The opposite of the Flatten brush is the Contrast brush, it pushes the vertices up or down in the direction away from the brush plane. Works similar to the Flatten brush, but simply brings the vertices from below the brush plane in an upwards direction. The opposite of the Fill brush is to Deepen by shifting vertices above the plane in a downward direction. Shifts the vertices inward or outward, depending on the average value of the vertices contained inside the formed brush stroke. Eliminates imperfections in the area of the mesh inside the brush’s area by smoothing the points of the vertices. Allows you to select mesh sections to be untouched by other brushes. The mask values are displayed in gray-scale. I.e. the darker an area is, the less impact sculpting on it will have. This brush collapses small edges. But, the brush has no influence if the dynamic topology is not enabled. 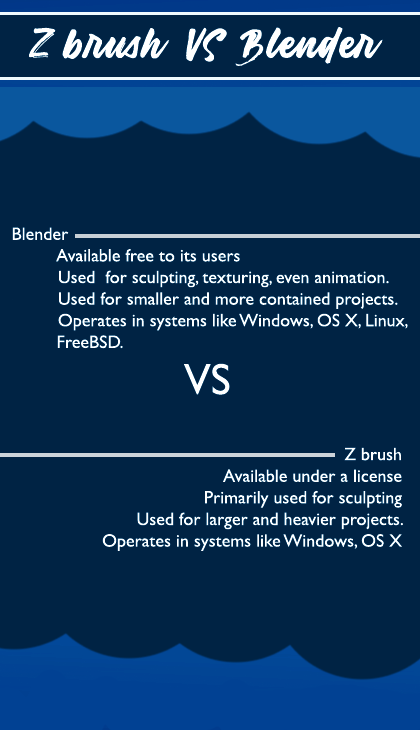 Also in case, you are wondering how Blender compares to other 3D modeling software; here is an infographic that compares the Blender and ZBrush software.